This ½ length seated double portrait is a rare record of a prosperous colonial couple, smartly and expensively attired in fashionable outwear suitable for paying formal afternoon calls. 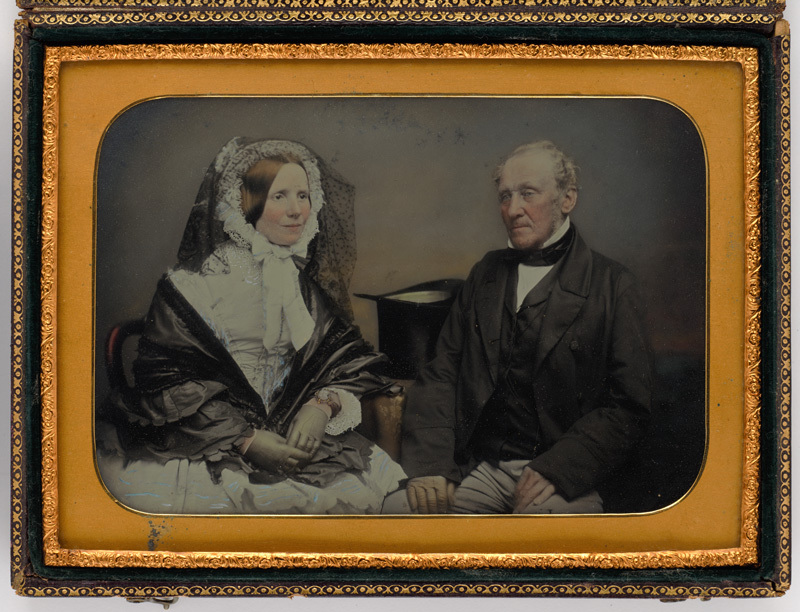 It is believed to show Mr and Mrs Francis Rawdon Hume. The sitters in this image face towards each other, a conventional pose for married couples. They appear to be aged around 50 and 40 years, conforming to the known age difference of about 12 years between Mr and Mrs Hume, which would seem to support this attribution. Mr Hume wears a double-breasted, dark woollen [sac] coat with notched shawl lapels and the newer style of looser fitting sleeve seen after 1854, over a single-breasted dark waistcoat and fawn coloured trousers, and a crisp white shirt with high-standing shirt collar points rising out of a black neck cloth. His silk top hat is placed on the table, resting upside down on its crown as it would be in a drawing room situation. He wears his greyish blonde curling hair brushed back from a receding hairline above clean shaven cheeks and a fringe beard. Mrs Hume wears a fashionable spring bonnet in the face-framing, shallow-brimmed style of the mid-1850s. Fitted with a fine black hail spot net/lace veil to protect the face against wind and sun, it is set back far enough on the head to display the inner brim filled with lace frills. Curving close to the face, but sufficiently flared to show off her strawberry blonde hair arranged in the smooth ‘bandeau’ style, a pair of pale silk ribbon strings attached with loops at ear level are tied in a crisp bow under her chin. Her pale [silk] day dress has a form-fitting bodice in the popular jacket style, the centre front opening marked with a [ruched] trim. She wears a dark silk shawl draped around her shoulders, tucked under the elbows and over the forearms in the approved manner, revealing flaring white undersleeves and a heavy gold bangle above her hands, clad in snug-fitting, fawn-coloured, wrist-length kid-gloves, clasped in her lap over the scalloped and pinked edges of a flounce, likely to be one of a series arranged in tiers, over the length of her full skirt. Francis Rawdon Hume (1803–1888) was born at Toongabbie, NSW, a son of Andrew Hamilton Hume who had arrived in Sydney to take up agriculture and other colonial appointments in 1790, and a younger brother of Hamilton Hume, the explorer. F.R. Hume was a farmer with successive land holdings in the NSW Southern Tablelands. 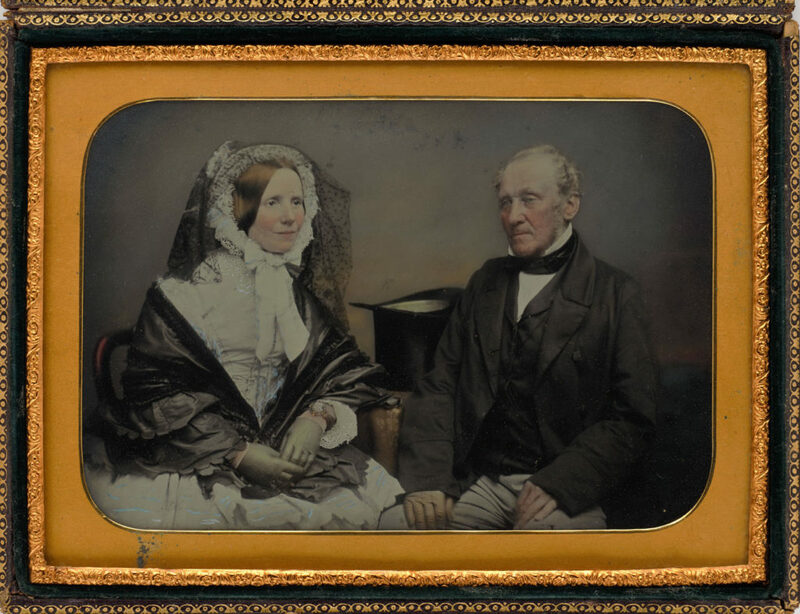 On 12 October 1830, he married Emma Mitchell (1815-1887), daughter of Mr. William Mitchell, a fellow Southern Tablelands landholder at Brisbane Meadow. The couple had 14 children (8 daughters and 6 sons), the youngest of whom was born at ‘Castlesteads’ the Hume family’s property at Burrowa, NSW, in March 1854. Mr and Mrs Hume died at Burrowa within 12 months of each other, aged 85 and 73 respectively.